The Committee Room departs from its presentation of the best in contemporary fiction to offer a classic story, Willa Cather's "Paul's Case," as TCR Story of the Month for October. "Paul's Case" has been called "a small masterpiece of sustained tone" and a story "justly admired for its narrative skill and its psychological portraiture." The story of an opera and theater loving Pittsburgh youth who makes a desperate escape from the reality of his ordinary lower middle class life, "Paul's Case" was the seventh and last story in Cather's first collection of stories, The Troll Garden, published in 1905. All of the stories in The Troll Garden deal with art and artists. Soon after the collection's publication, "Paul's Case" reached a wider audience when it was reprinted in McClure's Magazine, a leading general interest magazine. Cather was born in Virginia in 1873 and grew up in rural Nebraska. She did not attend school until she was eleven years old. Her first stories were published in a literary magazine at the University of Nebraska when she was a student there in the 1890s. After graduation Cather worked as a journalist in Pittsburgh for the Home Monthly, which also published a good deal of her early fiction. She later worked for the Pittsburgh Leader and freelanced as a drama and music critic. Seeking more time to write her own work she left journalism and became a high school teacher. Cather was in her early thirties and teaching high school English in Pittsburgh when she wrote "Paul's Case." It is the only significant use of her high school teaching experience in her fiction. Publisher Samuel S. McClure was so impressed by "Paul's Case" and the other stories in The Troll Garden that he offered Cather a job at his magazine in New York. Cather worked for McClure's as a staff writer and managing editor from 1906 to 1911. At McClure's Cather came into contact with many of the leading lights of the literary world including H.G. Wells, Jack London, Lady Gregory, Theodore Dreiser, and Ford Madox Ford. She was sometimes called upon to edit articles by McClure's muckraking journalists but took little interest in Progressive Era politics. Believing art and economics were incompatible, she disdained the work of fiction writers who used literature as a vessel for social reform. Cather resigned from McClure's after her first novel, Alexander's Bridge (1912), was accepted for publication by Houghton Mifflin. Her later novels include O Pioneers! (1913), The Song of the Lark (1915), My Antonia (1918), One of Ours (1923), and Death Comes for the Archbishop (1927). Cather based the character of Paul in Paul's Case in part on herself. His devotion to music and the theater and his desire to leave behind hard scrabble provincial beginnings for life in glamorous New York echo Cather's own ambitions. Cather died of a cerebral hemorrhage at her apartment on Manhattan's elegant Park Avenue in 1947. 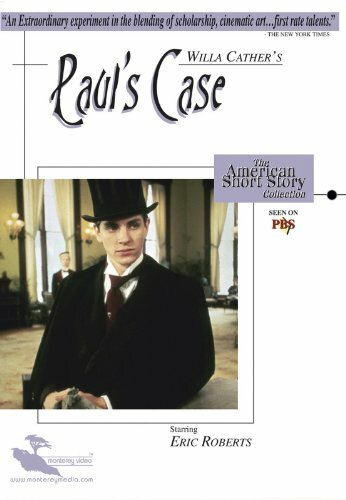 A 1980 film version of Paul's Case was made for PBS with Eric Roberts as Paul. To read "Paul's Case" click here (full text courtesy of the Willa Cather Archive at the University of Nebraska). Dorothy T. McFarland. Willa Cather,1972. Sharon O'Brien. Willa Cather: The Emerging Voice, 1997. James Woodress. Willa Cather: A Literary Life,1989.